• the business’ understanding of the technical challenges their requirements may present. Behavior Driven Development (BDD) can help achieve all of the above and ultimately, helps a business and its technical team deliver software that fulfills business goals. We’re going to put that under scrutiny. Questioned the BDD approach, the benefits it promises, talked costs and risks. Considered alternative methods for solving of the same problems. Notes captured by Albert Gareev. The “ubiquitous language” apparently is still easy to misunderstand or misuse. Naming convention challenges: do you say “Log in” or “Sign in”? Discussion notes by David Tangness and Albert Gareev. People may miss the ‘central’ conversation (distributed team, busy that day, moved from another project, newly hired, etc). The fact that tests are written in DSL format means documents should be relatively easy to read afterwards / later. Is it? On the other hand, is anyone getting value out of reading a long list of gherkin scenarios? When expressing requirements in Gherkin syntax, how do you limit the number of scenarios? It seems like Gherkin scenarios are supposed to map to business rules, so the number of scenarios doesn’t exceed what you’d have if you just wrote down all the business rules. But then how do we use the scenarios? For any input/output, how do you figure out if it satisfies the scenarios? You need to break the input/output combo into relevant factors, and compare each factor against scenarios. But you can only do that if you know which business rules map to each scenario. So what was the point of the scenario in the first place? Takeaway. Need to see some examples of “how people choose / limit their Gherkin scenarios.” It’s not clear that creating Gherkin scenarios is superior to just recording business rules directly. Idea. BDD and Gherkin are separable, we should distinguish between benefits/failings of BDD approach and Gherkin scripts. Takeaway. Are there any examples of BDD that are NOT using Gherkin syntax? If we can figure out the benefits/drawbacks of Gherkin then we should be able to invent an alternative. Surely there must be some alternatives published somewhere? Question: is that a real problem? 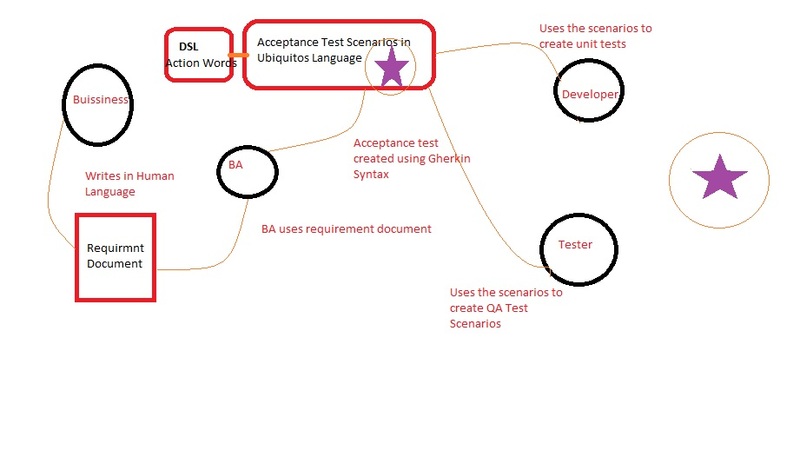 Test cases were required for scripted regression testing. But there are more effective and efficient ways to do that than with scripts. Challenge. How do you handle the flood of old test cases which need to be converted? Challenge. How do you keep up your testing progress AND effectively do conversion? Question: what is the purpose of those Gherkin files? Who will use them after they were written? Takeaway. Think about who benefits from those files. Weigh their benefit against the costs of maintenance. If we continue adding details, will the scenario end up being too long? Should we split it into multiple scenarios? E.g. Have separate “reusable” scenarios. We need many analog details which will take a very, very long time to communicate in text. How do we express this in Gherkin? “A picture is worth a thousand words”. And the text is in 16pt. And the user’s IP is captured. ….. and so on. Nobody will want to read this. Concern – Capturing the different translations of the message in this format will produce many, many scenarios. But from a business perspective we do need to capture the requirement, and if Gherkin is how we’re capturing business requirements then we have no choice. Group writing of these Gherkin scenarios indeed feels like fun. It is a creative and social exercise. On the other hand, it feels like it has little to do with the actual work. Programmers will still need to write code, and testers – to to test. What looks like an extremely simple requirement (Display “Hello, World”) becomes a multi-line statement when we take a close look. And notice: we didn’t even discuss cases when something goes wrong. It actually becomes time consuming to write all of the and-blocks. The scenarios are a kind of a “happy path” description. Things always go wrong, and we need to test around a lot. There are a lot of assumptions that most likely won’t be pre-scripted in Gherkin scenarios. We need to discover and evaluate them. Not all scenarios are automatable. Checking different conditions ought to be done at different levels: unit, API, GUI, through integrated products. That means, a single scenario will be torn apart anyway, and tested in a distributed way. Writing all these repetitive scenarios requires an automation on its own. Writing an interpreter code for all these scenarios becomes a serious task on its own. And testers may not have deep programming skills to accomplish it. “Ubiquitous language” turned up rather poor as a universal modeling tool: some information better described with a sketch, some as a table, some as a formula. It requires certain style of thinking if you want to represent everything with Gherkin. At times, it feels unnatural. Would stakeholders even agree to describe everything in Gherkin terms? How do you refactor Gherkin? If you have modular scenarios built upon each other, then when you refactor one you must refactor the rest. We all agreed that trying to write Gherkin scenarios spurred a lot of questions and ideas. The actual artifacts weren’t perceived as important. In fact, after the third pass writing them felt as a nuisance. In this sense, BDD / ATDD do seem to be adding value. But it feels like we need to “extract” those benefits a leave the burden. Core value: the meeting of clients / customers / developers / testers, covering each others blind spots and ensuring everybody is “on the same page”. The opinions were split. No one seem wanted to try implementing BDD at the full extent, with conversion of all requirements and all tests to the Gherkin scenarios. Some still maintained a belief that BDD would enable automation that will bring a regression testing relief. Other remained skeptical. As a further expansion, the participants agreed to explore alternative approaches that promise the same value as BDD but don’t introduce the problems and expenses. 4 responses to "Roundtable on Behavior Driven Development"
* BDD scenarios weren’t collaborated on from the source of requirements, BA, QA, and devs. * BDD scenarios weren’t written at the business level (so of course the business user ran away when thinking of all these detailed scripts). The point of BDD is to get away from writing imperative specifications that attempt to specify everything which is impossible. BDD is a cross organizational process. In this case, because only QA was involved, the process turned form being *Behavior* Driven Development into using Gherkin to do make automated functional tests. At a minimum, BDD should encompass the BA, the Devs and QA before I’d even bother to use this process. Without involving the business, you’ll still have “requirement misses” because they are necessary for the process to work well. A business person needs to collaborate with such a team at least 2 times a week (Backlog Grooming, Sprint Planning, meeting with the BA to prepare a first cut) and of course highly functioning teams that deliver with little to no requirements misses have a business person (someone who uses the product or manages those who do) touching base (standup meeting) every day. To the degree that it helps create / encourage a structured conversation around scenarios between team members – it is good. To the degree that it creates a simple to understand, fast to run, easy to maintain, subset of the most basic scenarios that – everyone agrees are important, and should always work ‘correctly’ – it is good. To the degree that there is not clear stopping criteria, that the number of scenarios is infinite, that adding one more scenario is perceived as free (Weinberg’s White Bread Warning), the tendency of the tool to reshape your mind and how we think of the testing problem (when you have a hammer …; and Gherkin passing = testing done = ship it = lack of fear of the false negative ), and the ease in which it is to slip beyond your ability to master and apply the tool- versus becoming a servant of the tool – that is problem. For me, I prefer to focus on ATDD versus BDD. I prefer on getting the conversations right, then avoiding a conversation by using of a formal detailed grammar tool. BTW – Great experience report and discussion. I feel your BDD pain. Where I have used it in the past (can think of three examples), it went from adoption to abandonment/refactored into ATDD in two years. I like the opening where you mention the disconnects from the BDD guide. The report then quickly dives into matters of the automation. Valid considerations to be sure, but I find them to be a bit premature. Griffin’s and Lance’s comments above ring true for me, though I have typically used BDD and ATDD interchangeably; it appears I need to do some more homework on the distinction.